Are you having trouble in thinking about the best romantic dinner that you can prepare for your partner? Setting and preparing a romantic dinner is quite difficult but with your effort and willingness to do anything to make it perfect you could probably get what you want. Romantic dinner is one way of expressing your love and affection to someone that makes your life happier and better. You can treat your partner and prepare romantic dinner that she never expected. 1. When you want to have romantic dinner you must set the mood of your dinner place as romantic as possible, try new places such as beaches, romantic picnics, or new restaurants. 2. Romantic dinner always start with drinking that will inaugurate the start of your dinner. Be careful in choosing the bottle of wine that you will prepare, it is advisable to choose red wine as possible because it is one of the romantic choices that you can make involving the kind of wine that you are drinking. Make sure that you put your wine or beer in a fridge in advance so that both of you will drink it cold. 3. In preparing your menu you must consider the simple appetizers that you can have. Fingers foods will do. You can simply prepare salad and make devile eggs that you can enjoy while you are waiting to cook the main course. 4. If you want to be more romantic you can also prepare your main course together at home that can also be your bonding moment with each other. You must choose your food that has easy preparation so that it will not make you wait for too long. One of the most recommended foods in a romantic dinner is sauted chicken with matching vegetables. Baked salmon with the combination of rice and sprouts of Brussels is also one of the best ideas that you can prepare for your romantic dinner. If possible you must avoid the foods that are messy to eat so that it will not give burden in cleaning after you finish your romantic dinner. If you prefer having dinner romantic at home rather than eating at restaurant. Prepares the foods that will not make you feeling bloated after you are done with your dinner. After you are done with your main course, choose the simple dessert as possible like ice cream or even simple cupcakes will do. 5. Your romantic dinner will be more appreciated if you set your location with the romantic decorations that will surely make the moment very special. You can have scattered fresh rose petals, bouquet of flowers and light the unscented candles that can enhance the romantic moment that you’ve prepared. You can also play classical music or any kind of music that has significance to your relationship. 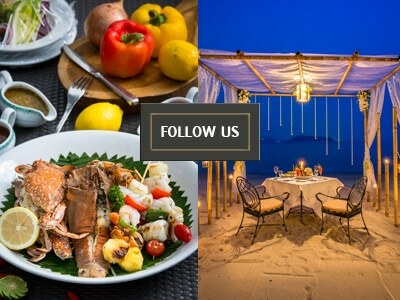 If you happen to be taking a holiday in Phuket, be sure to visit our Nakalay’s romantic dining. We pride ourselves as the most romantic dinner in Phuket! Dine on a private beach in private candle-lit beach cabanas with your toes in the sand!